With the accident and all, Mom didn't have as much Cherry time as we planned. But this weekend she did manage to take in at least two pink signatures. Saturday morning and afternoon, she and Shuga watched with horror as the green took over the weather screen for seemingly the entire day. Brows were raised when the Street Party wasn't called off, but in the end, the call was good. The weather cleared and except for the puddles, a brief drizzle and the air of frizz inducement, the night was near perfect. Mom and Shuga caught up with my God-dad Brad (of 11th Hour fame) and along with a safe count of 350 street revelers, enjoyed the sounds of James Brown's Soul Generals and went back to 90s with Tone Loc. Even though Loc played approximately 3.5 songs, Mom said what more could he have done? No telling what Loc got paid for the gig, but from what I hear, a young Maconite named Madison stole (or carried) the show for $100. For those of you who stayed inside and scoffed at the notion, Madison's "Chain of Fools" is dedicated to you. 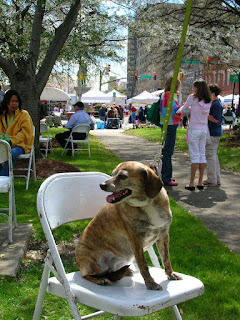 Since I haven't been checked out of intensive care, my counter partner in crime, Miss Kitty, the brindle Beagle mix who once nursed a litter of kittens (and double-dog-dared me to cross the street - grr), went with Mom and Shuga D to the Mulberry Arts & Crafts Festival as a stringer for Candy's Land. Reporting below-knee-high amongst the packed crowds and near-perfect weather, Kitty said she and Mom agreed that the streets of New York were easier, but by the looks of things, the Cherry Blossom Festival was definitely in the pink as it came to a close. Cross your blossoms I get to come home tomorrow!